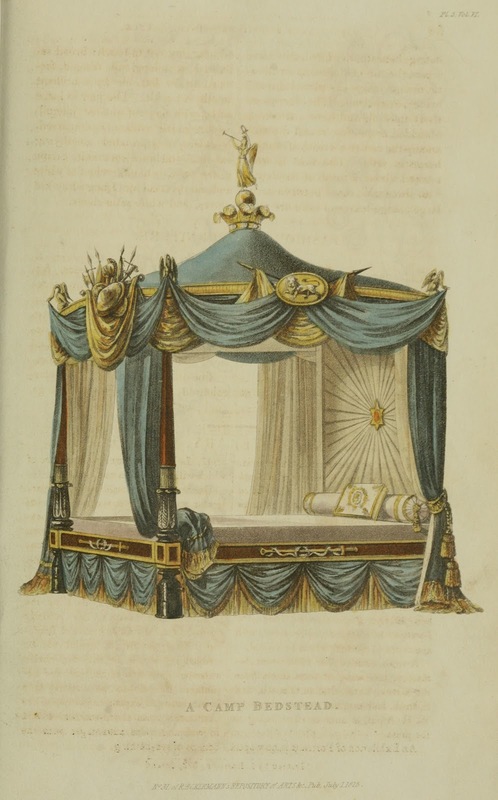 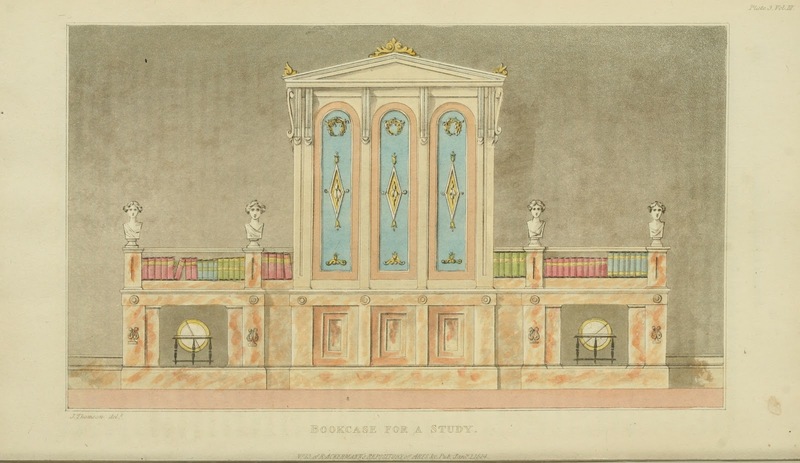 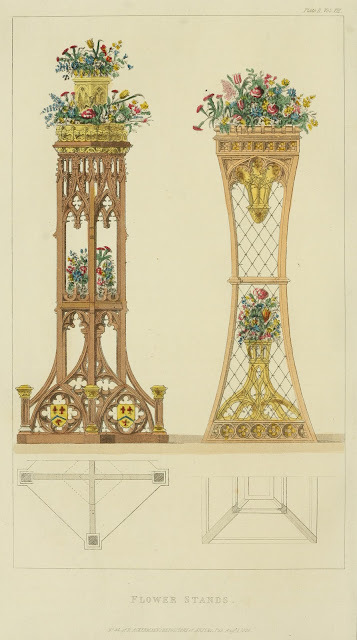 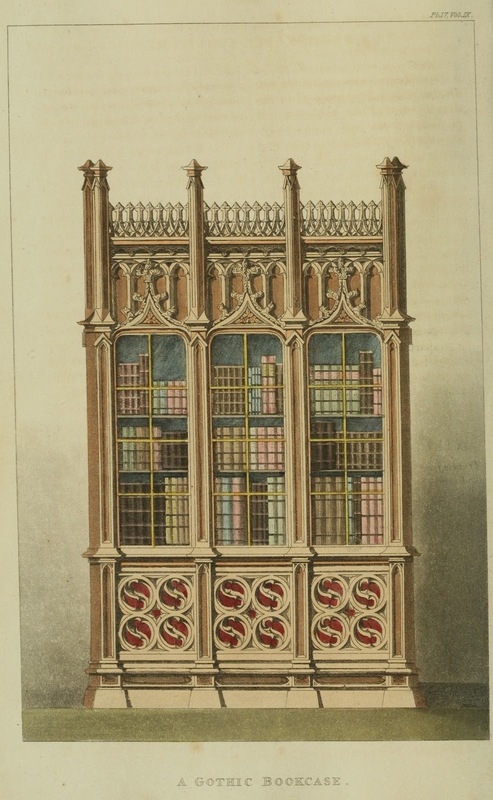 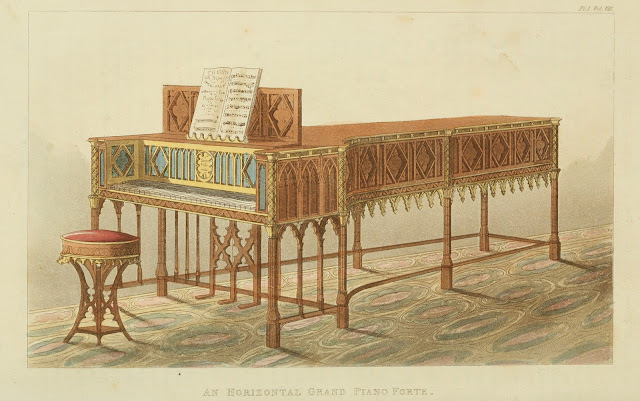 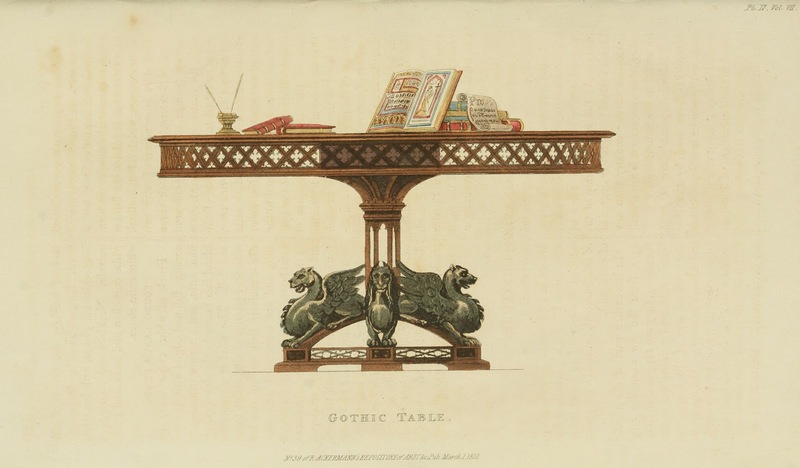 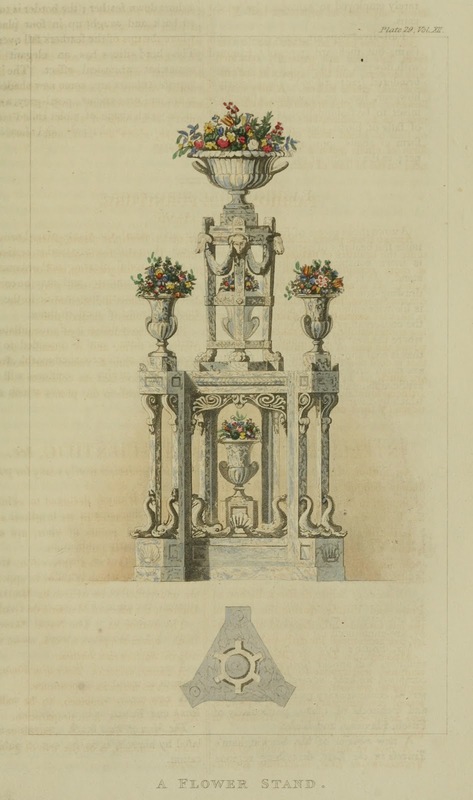 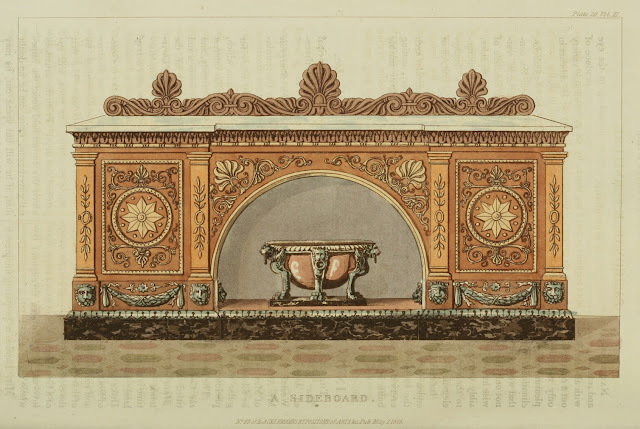 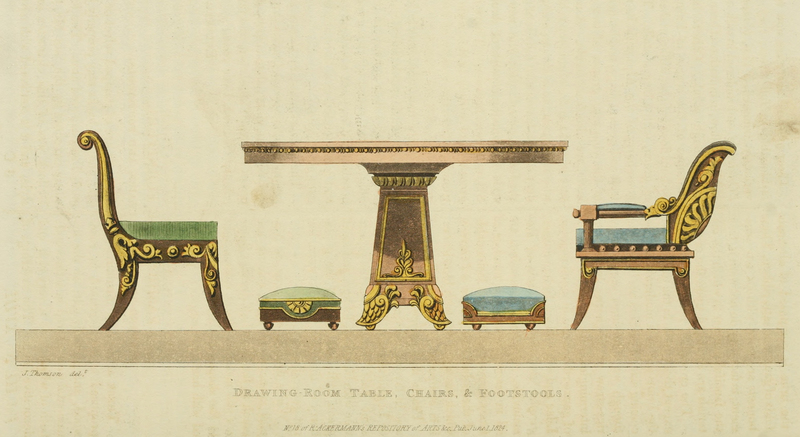 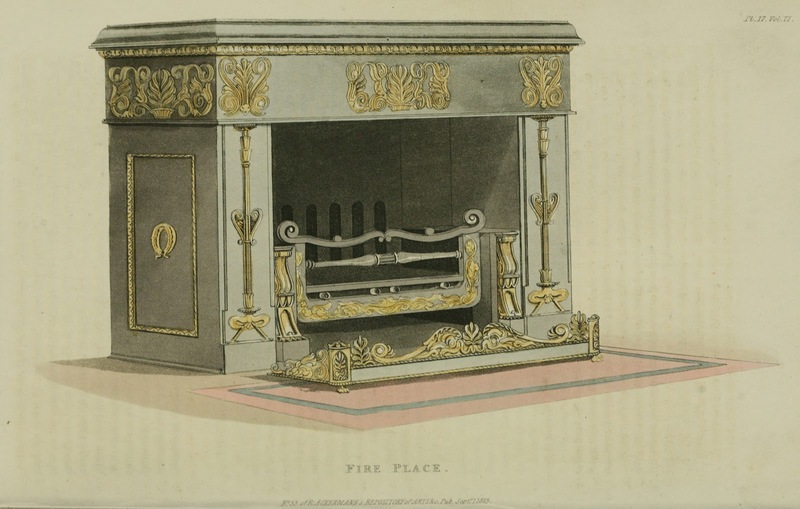 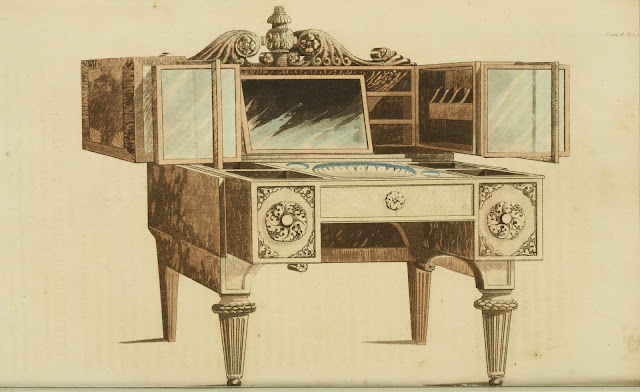 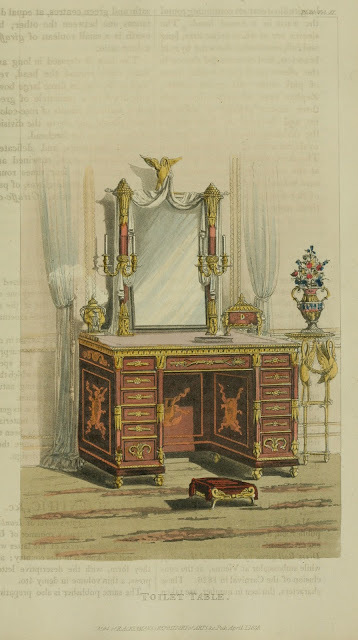 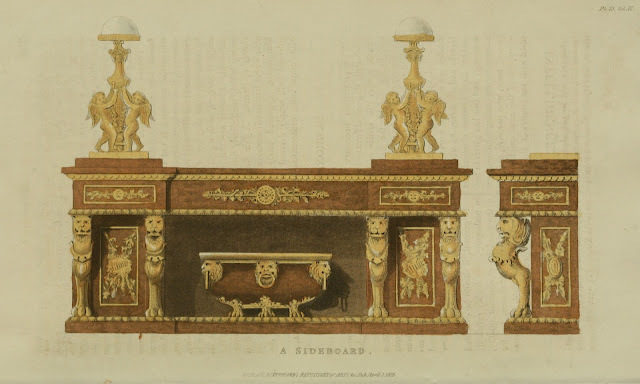 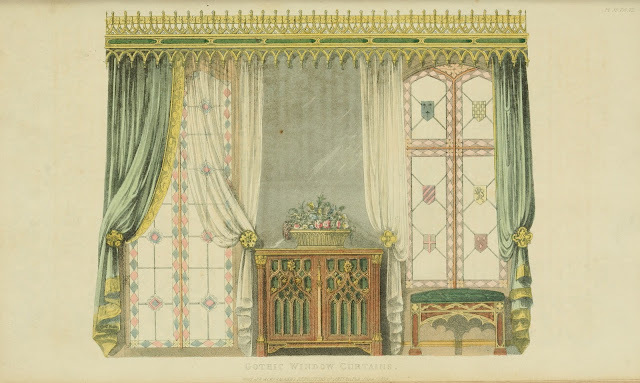 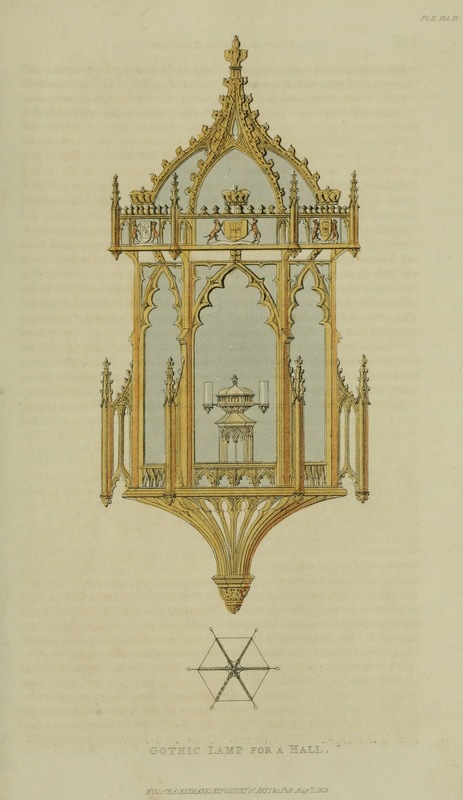 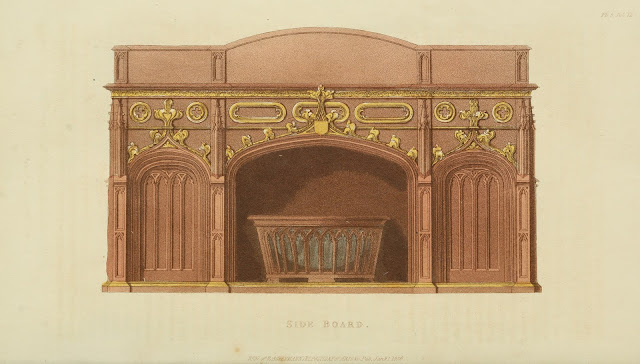 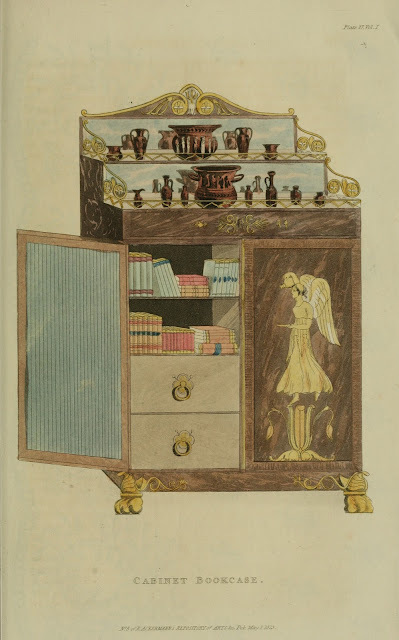 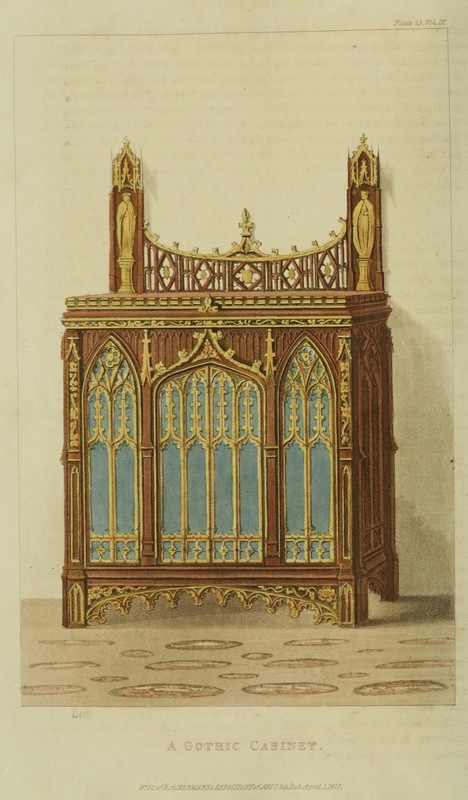 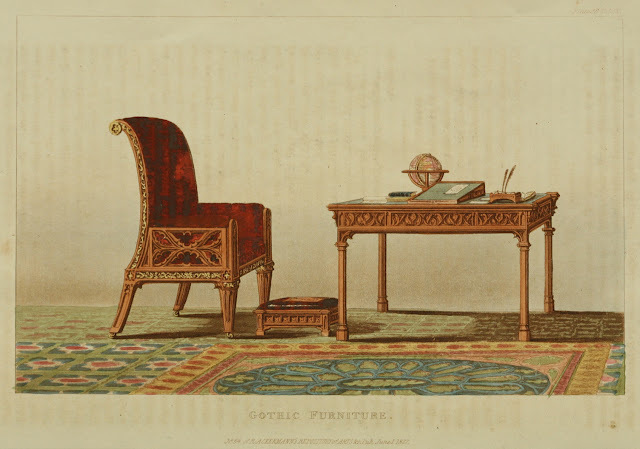 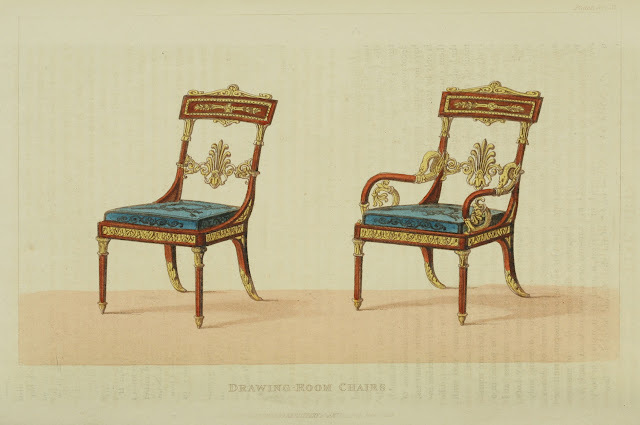 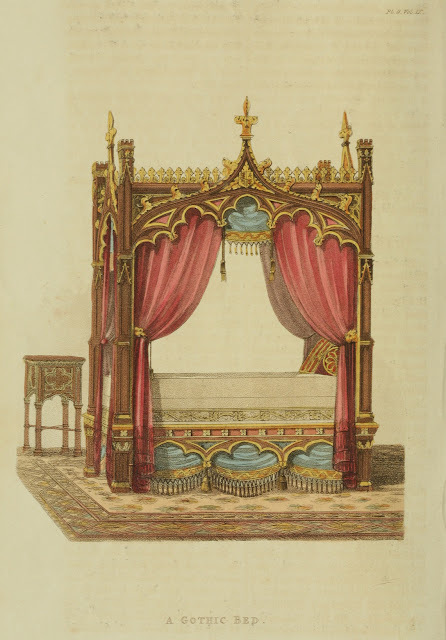 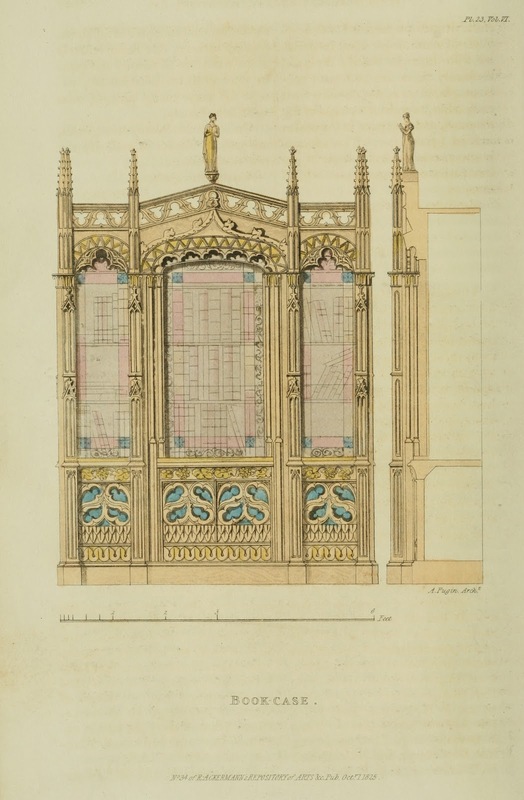 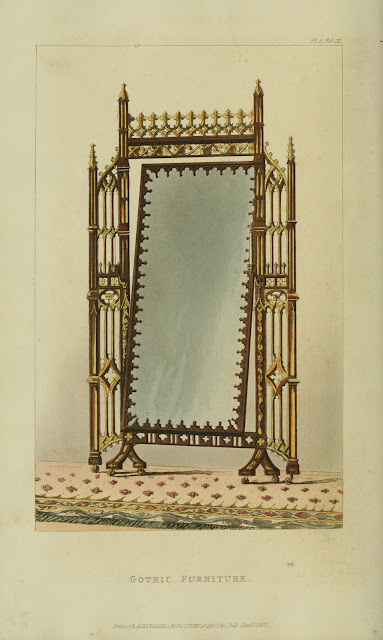 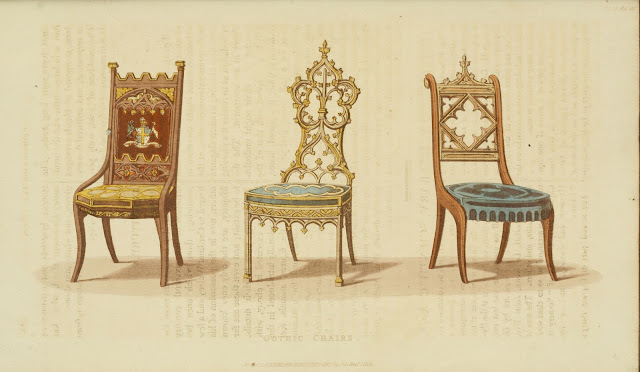 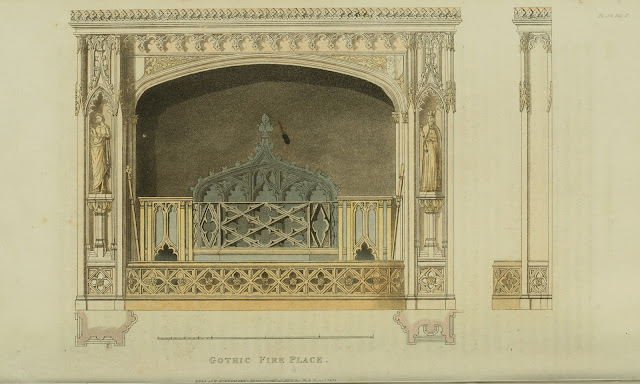 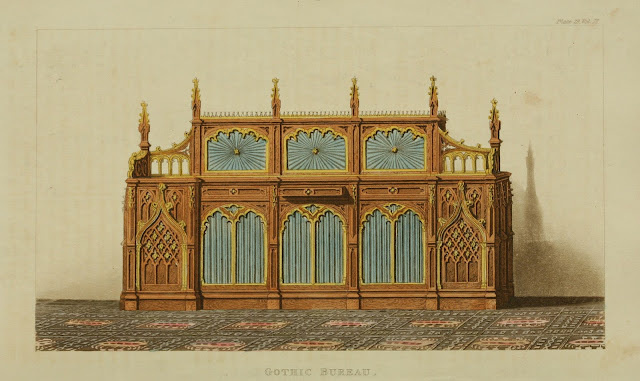 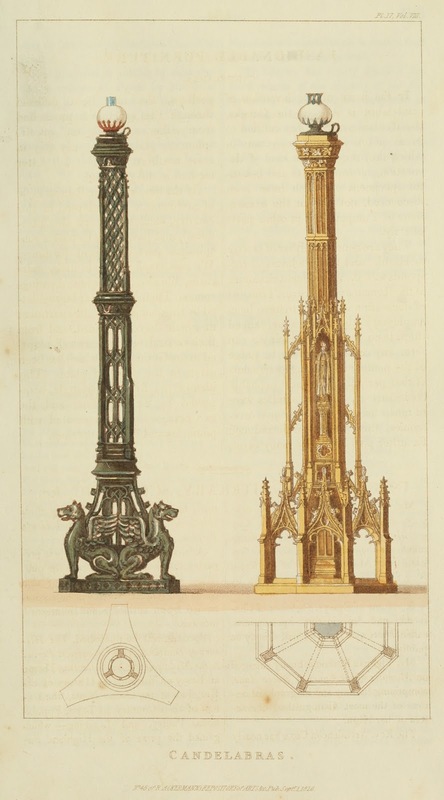 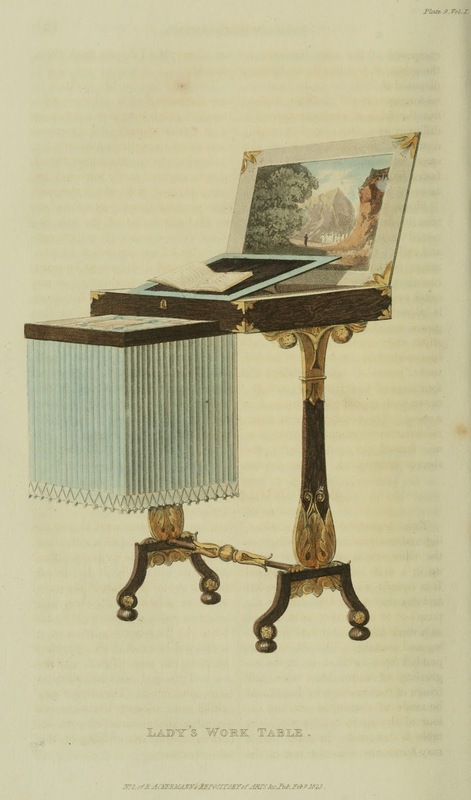 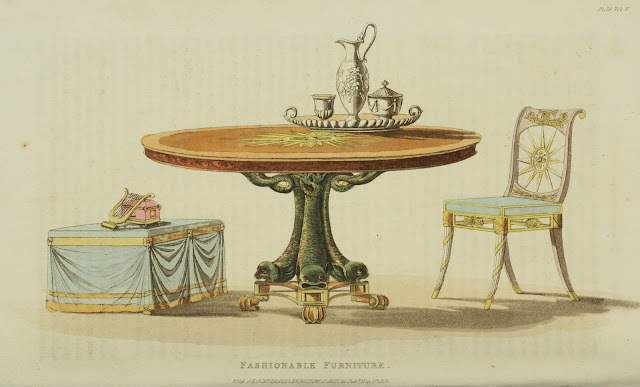 of Regency Furniture from Ackermann's Repository. 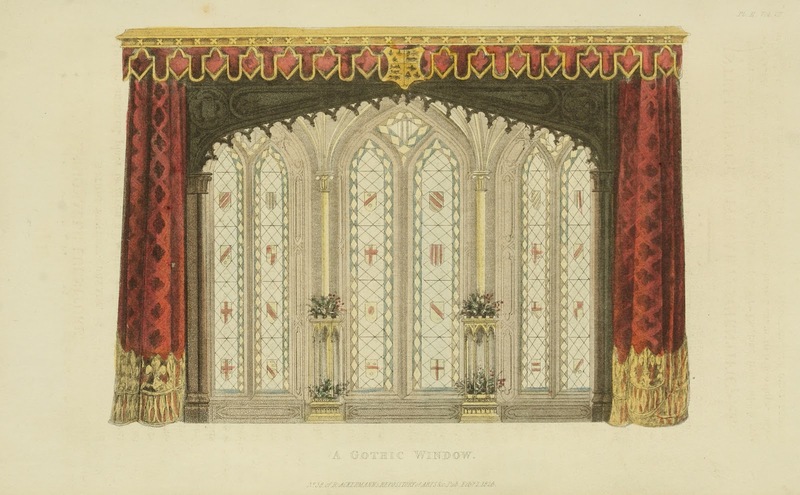 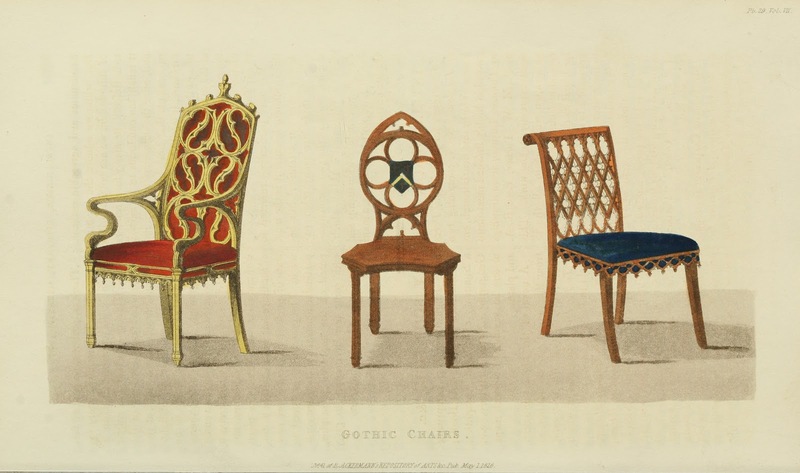 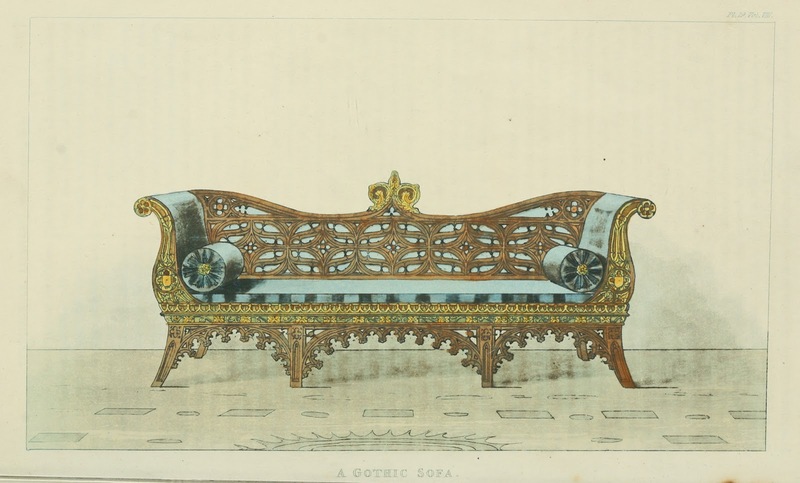 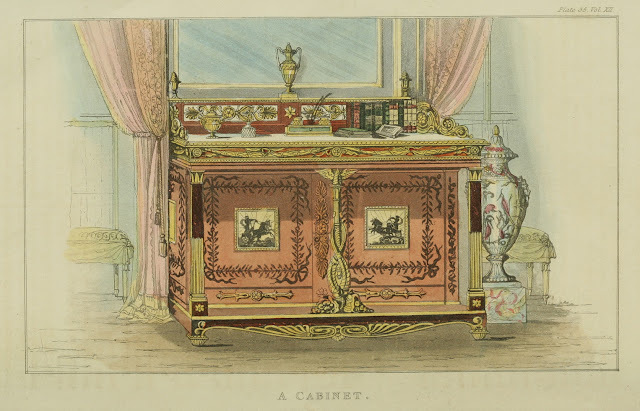 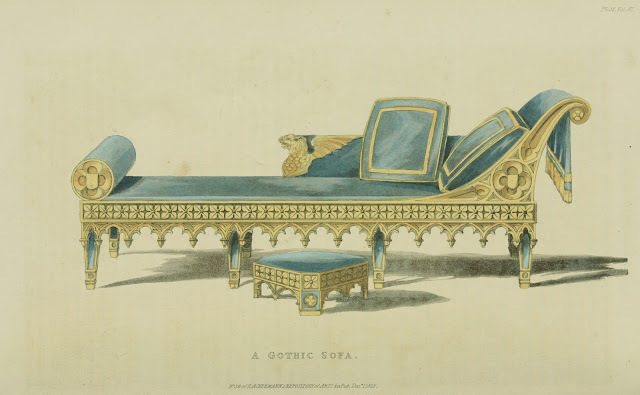 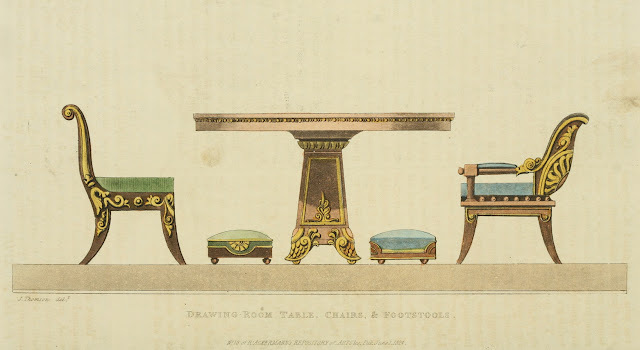 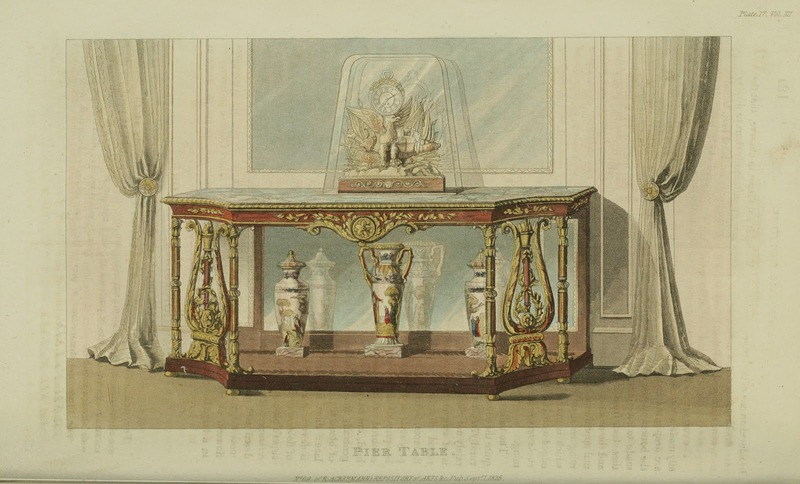 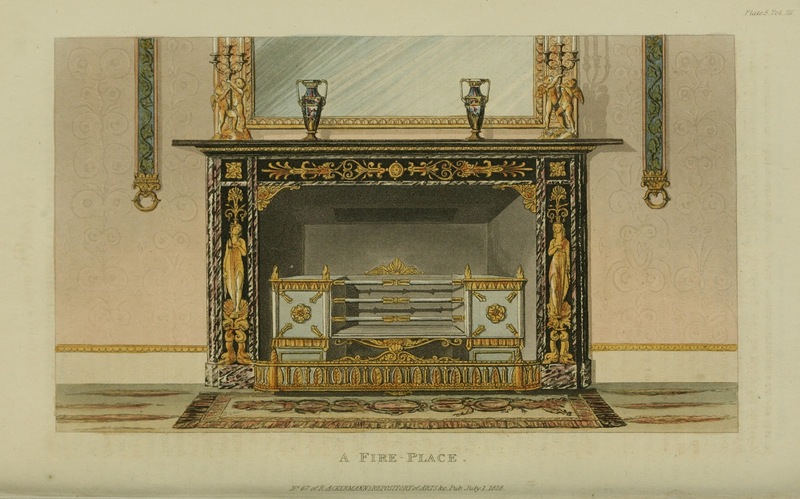 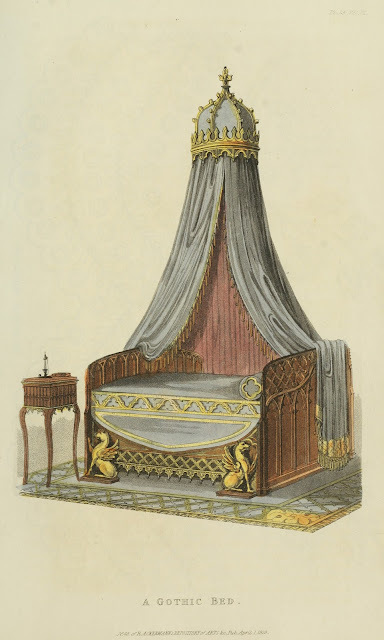 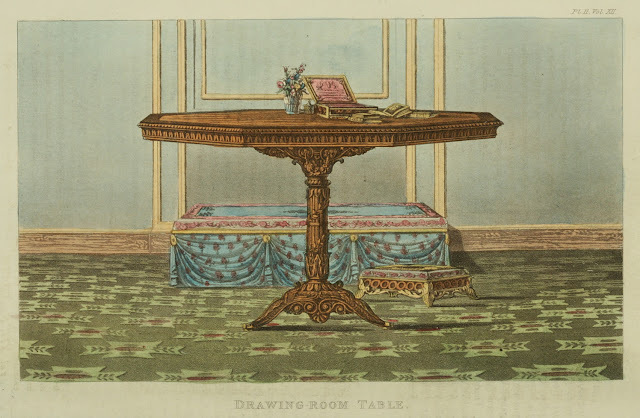 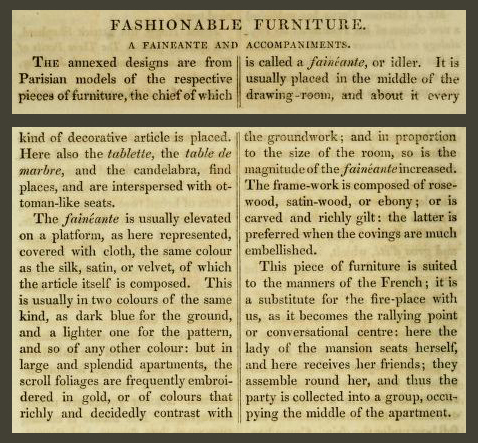 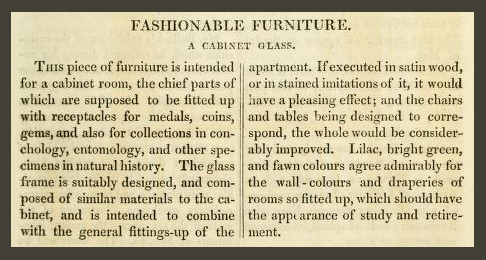 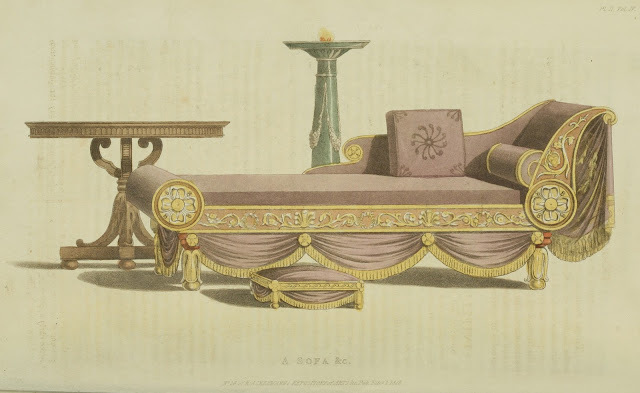 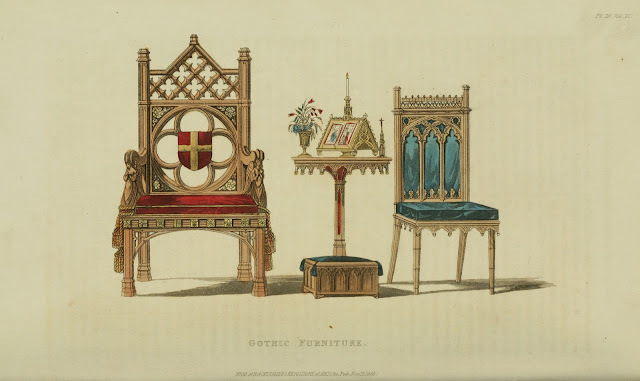 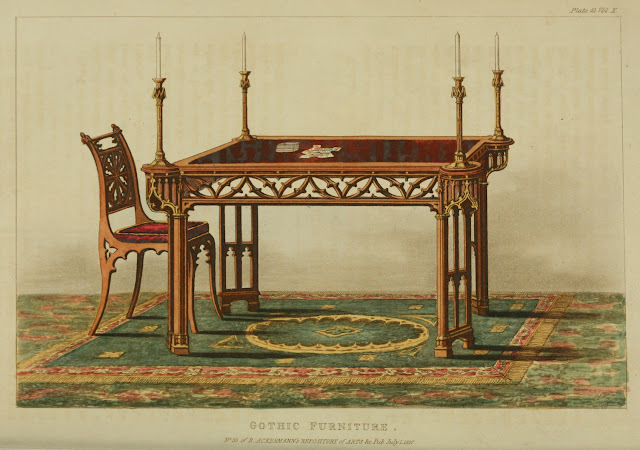 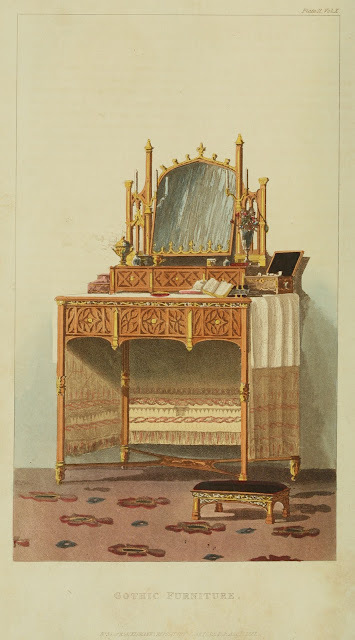 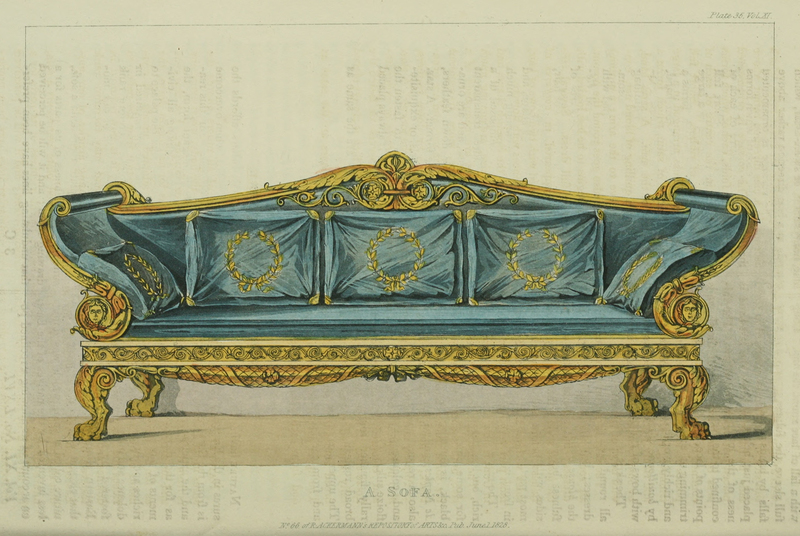 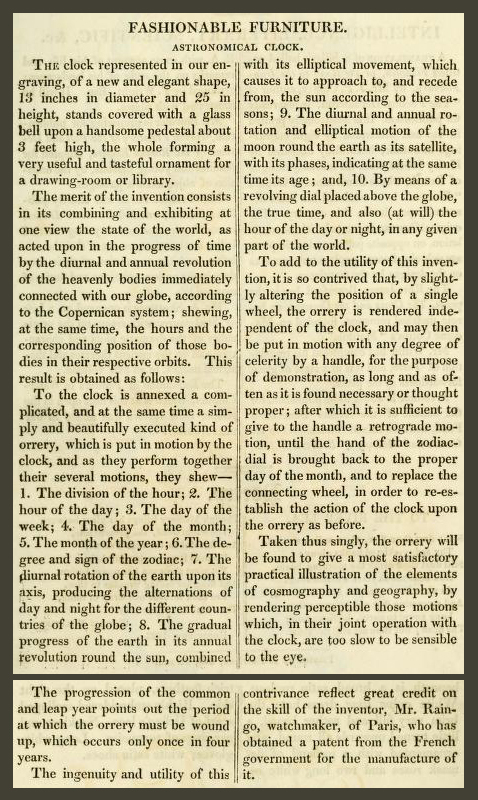 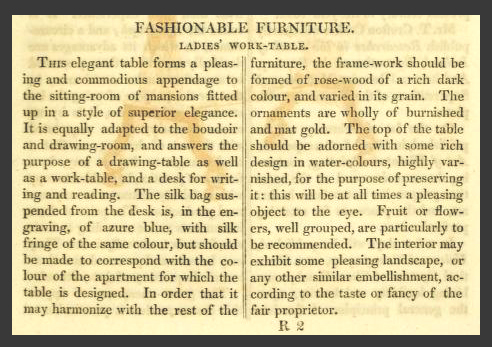 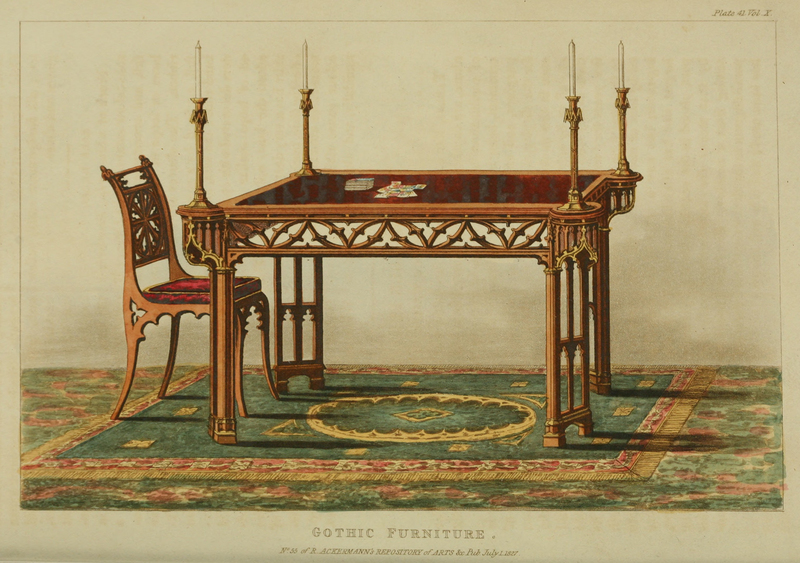 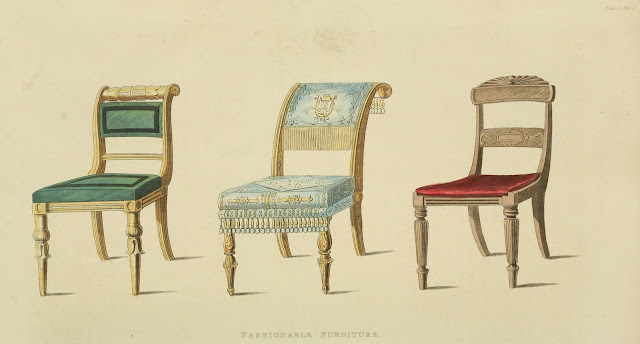 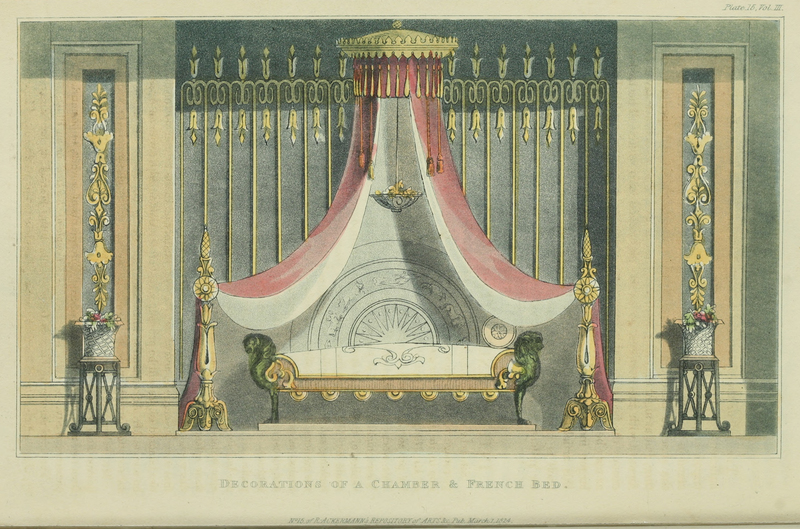 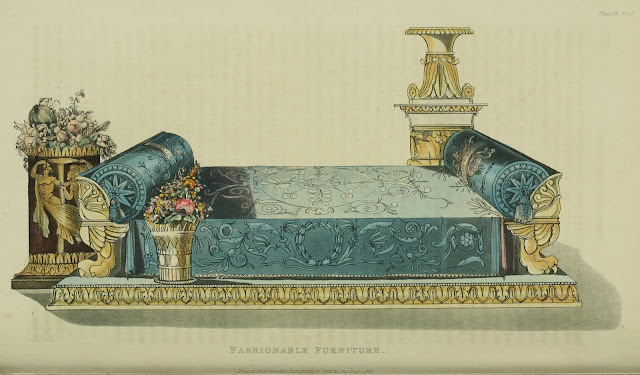 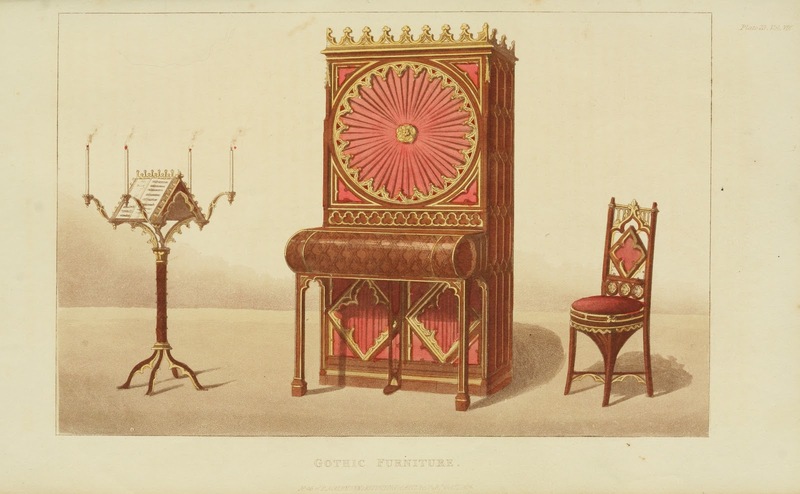 This post will cover the furniture items from Series 3 which were published from 1823-1828.
but what a bounty of images they provided in their 20 years of publication. 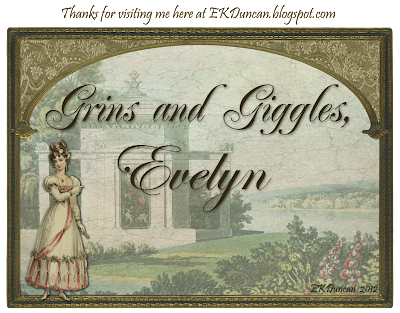 It's been a true pleasure posting about them and I hope you've enjoyed seeing them too! sofas, beds, chairs, accessories and Gothic styled furnishings. 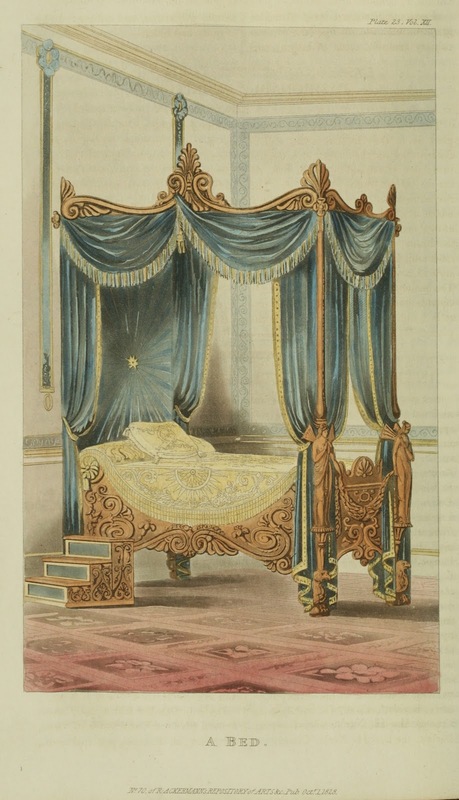 was a beautiful faineante and an amazing state bed that were not to be missed. 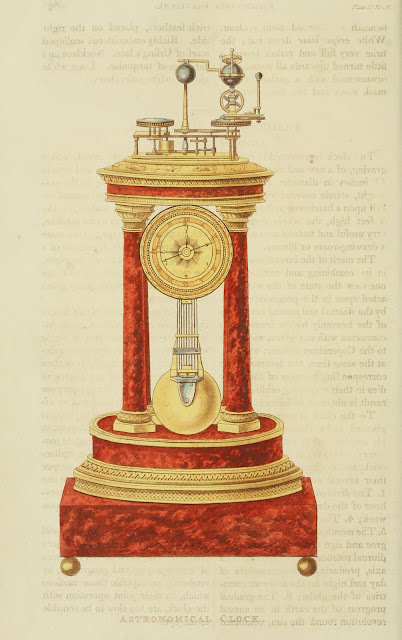 including some very unusual items for the collector and those lovers of timepieces. 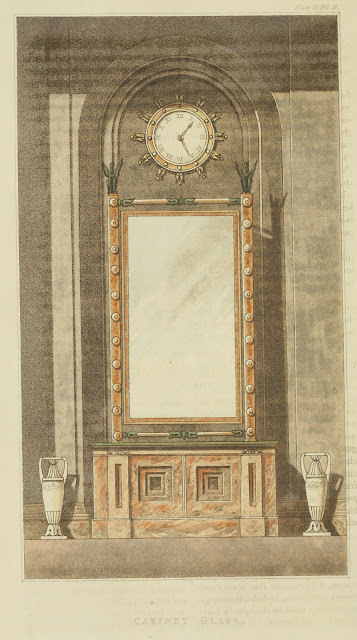 I created a fun piece of artwork called "Waiting for Midnight"
using this item in the background. 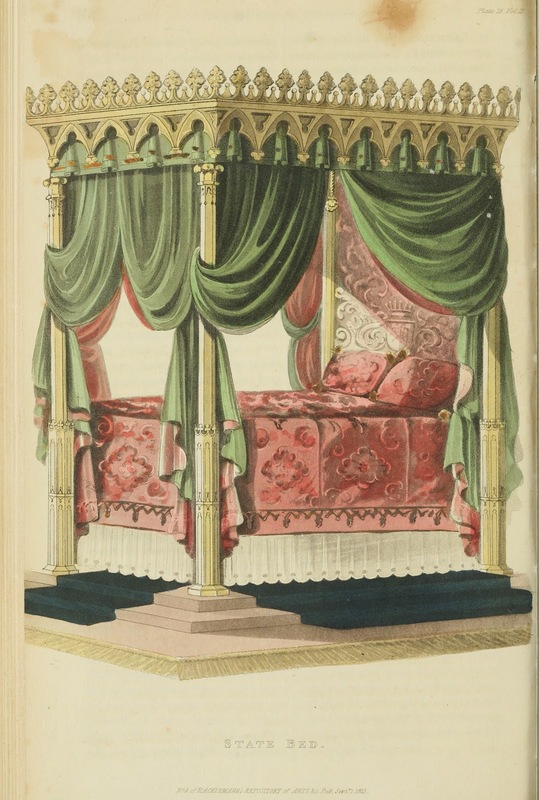 impressive "camp bed" to heavier Gothic pieces that will continue through 1827.
the Gothic style - even the window treatments. Gothic, Gothic and more Gothic that was the trend for 1827. 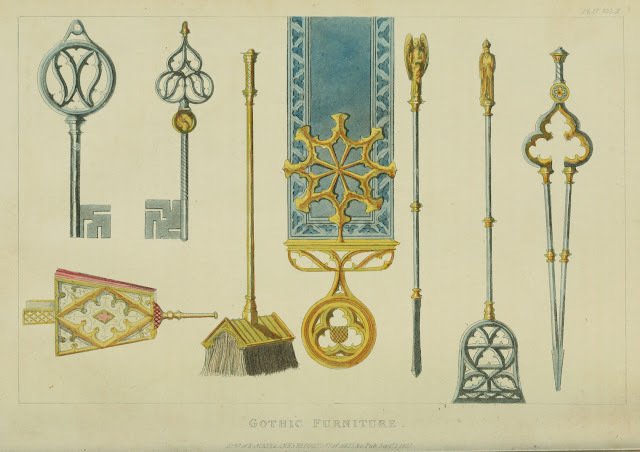 There are all kinds of Gothic goodies from looking glasses to keys. 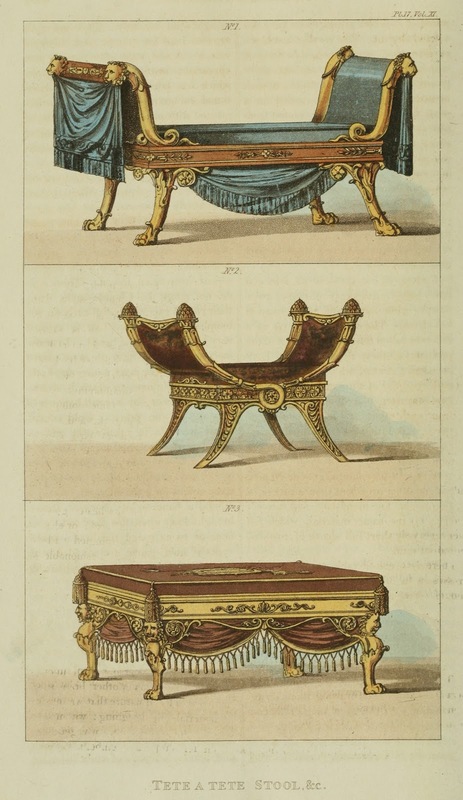 furniture plates returned to items of a more classical fashion. 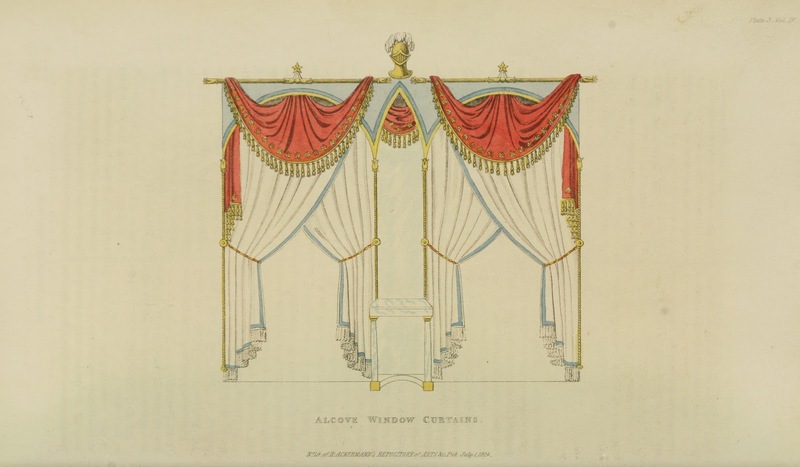 Beautiful and elegant just as I like to think of regarding the Regency era. And this concludes the furniture plates for Ackermann's Repository. I hope you have enjoyed it as much as I have! I started posting images from Ackermann's Repository on my blog back at the end of June 2011 and have been blogging about them for over 6 months. It's kind of sad for me to wrap up the series after putting so much time and effort into it but alas my muse is calling me in other directions. 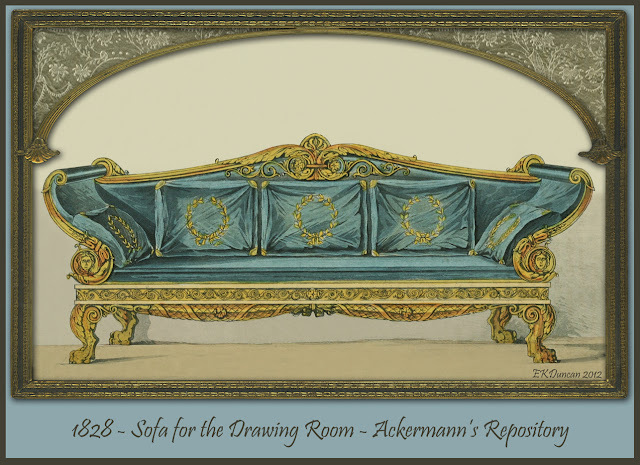 I'm sure I'll revisit items from Ackermann's every once and a while just for the grins and giggles of it; but I hope you keep checking back just to see what other fun things has caught my fancy. 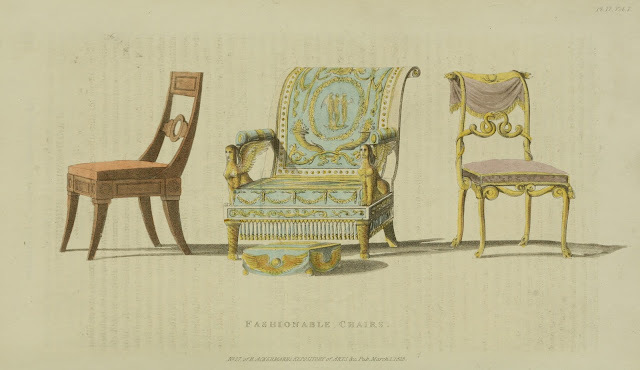 www.archive.org (a wonderful resource of amazing vintage images and books).